In 1997, when the US President crashes into Manhattan, now a giant maximum security prison, a convicted bank robber is sent in for a rescue. NYTimes: Set in the not-too-distant future (1997), the film works so effectively as a warped vision of ordinary urban blight that it seems to be some kind of hallucinatory editorial. It may even remind you a little bit of ''Alphaville,'' if ''Alphaville'' had been directed not by Jean-Luc Godard but by Federico Fellini in an uncharacteristically antic mood. Its ecomony of style, though, would do credit to Don Siegel. Roger Ebert [via roger ebert's worst reviews]: John Carpenter's Escape from New York is a cross between three of the most reliable ingredients in pulp fantasy: (1) the President is Missing, (2) New York is a Jungle, and (3) the Anti-Hero as Time Bomb. Carpenter has gone after an original angle on each of the ingredients, with disappointing results. I'm the Duke of New York, A Number One! 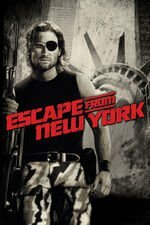 Snake Plissken is an iconic character, and I think of him whenever I encounter yet another of those tiresome articles about how wonderful New York City is. I still love that rather than pay to have the wireframe of the city rendered, they simply built a black model of Manhattan and painted the wireframe on it. This was a year before Tron, so it's pretty likely making a model was not only cheaper, but less time consuming. Also interesting, this movie was one of the major influences in the original Metal Gear game, right down to Snake being the name of the protagonist. "You, me and Fresno Bob. You know what they did to Bob?" Carpenter conceived of this as being a contemporary Western, which sort of makes sense, as lone gunslinger on a mission in a lawless land is a pretty classic western trope. It explains the very weird scene of the Indian attack atop the World Trade Center and Harry Dean Stanton calling them savages, but, good lord, the film did not need that. It seemed weird then, and indefensible now. Otherwise, this is a perfect film. And really, the time this was made was kind of the nadir of urban America - it wasn't too much later that the tide started to turn on urban resurgence. I wonder how many people reading MeFi were not born when this movie was set? Like Ghostbusters, this is a movie that does not need to be remade since it's basically perfect, but it does maybe need a second sequel, so we know what Snake is doing in 2017. I wonder if that's why the sequel bombed so hard? I mean, it was also not a very good movie, but EFNY succeeded by tapping into something very real in the zeitgeist of the late 70s/early 80s. EFLA didn't have anything similar to draw inspiration from (the LA riots of the early 90s were a one-off event rather than a new trend) and therefore wound up feeling empty. The main problem with EFLA was the same problem with a number of sequels (the ones to Men in Black, Ghostbusters, and Predator, just to name a few off the top of my head): an insufficient willingness to do something really interesting with the premise. There are many things that are deeply messed up about LA, stuff that NY doesn't really have to worry about, like being near a fault line, California's always-near-drought situation (worse now, of course, but never really far from it, ever), etc. But the movie substituted heavy-handed political anviliciousness for the often sly and subversive humor of the first movie. I watched this for the first time recently, and I was shocked at how slow it was and how few surprises there were. Perhaps this is sacrilege, but I don't think this movie has aged well at all. All its innovations of character and atmosphere have been mercilessly repurposed, repackaged, parodied, and improved upon by a thousand other pieces of culture. Without any novelties, there's not much left in it that's very good. Wish Granted: Netflix just released 'Snake Plisken Saves Christmas' under the name 'The Christmas Chronicles'... I mean they keep referring to him as 'Santa' and he's lost the eye patch... but man... yeah.